This weekend had a lot of fireworks in it. 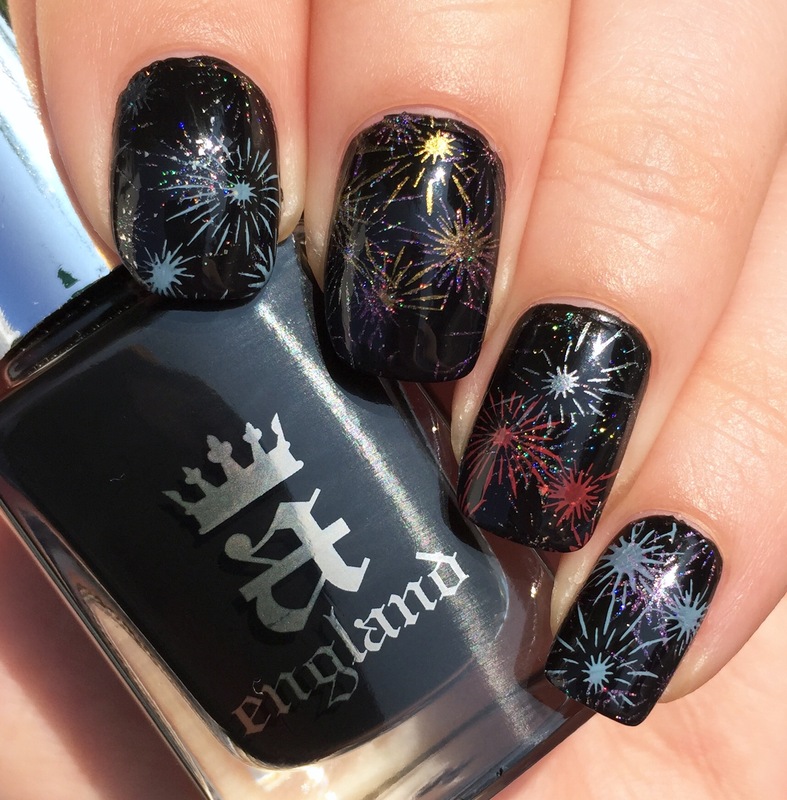 With the holiday and everything, I decided to put some of those fireworks right on my nails (albeit in a safe manner because fire)! So without further ado, here’s a zillion pictures of my handiwork. I’ve stamped before, but always in just one color and one layer. 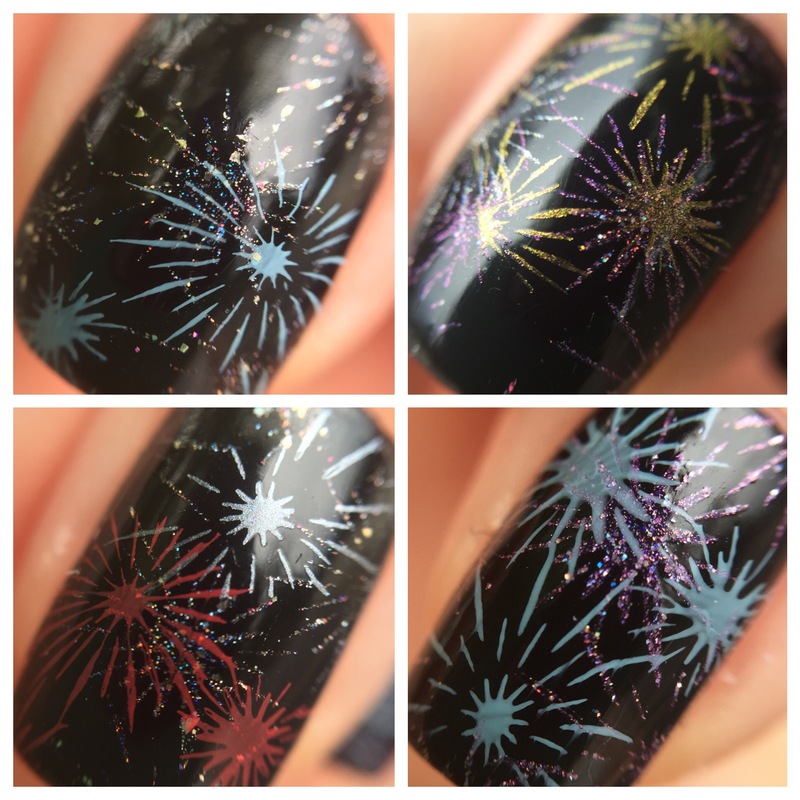 This time, I decided to test my skills by stamping in layers (like real fireworks) using six different colors! 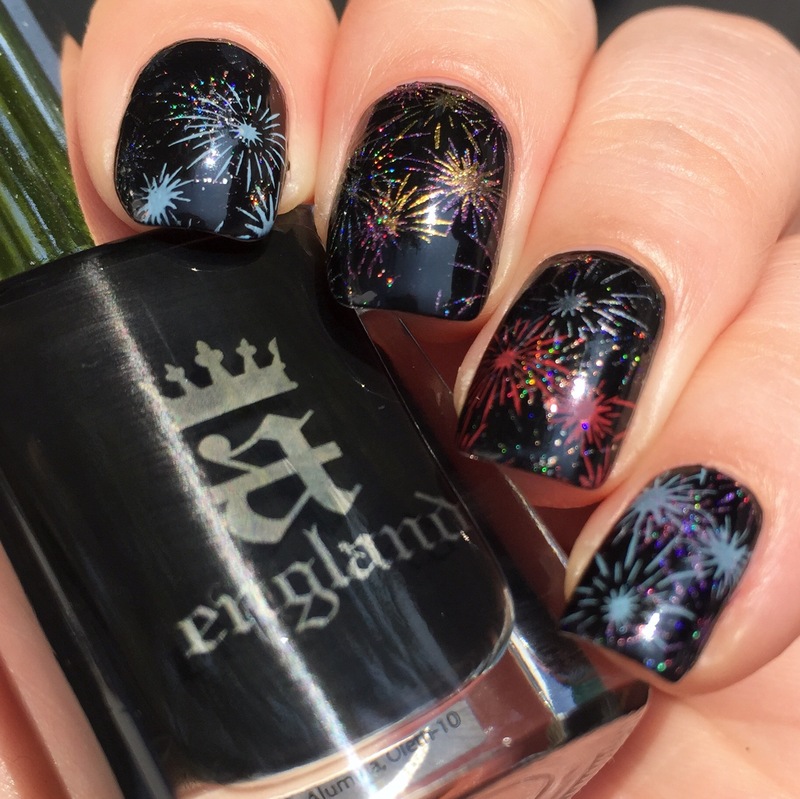 I used my favorite one-coat black for the base: AEngland “Camelot.” Over that, I used ILNP “Pink Mimosa,” Colors by Llarowe “Oops,” Julep “Jeanne,” and three Bundle Monster stamping colors (“Liquid Gold,” “Crimson Red,” and “Iced Silver”). I used my brand new Bundle Monster XL-23 plate for the firework image, and I turned the plate as I went to get different fireworks. As I was turning I noticed that my plate is imperceptibly bent, so it is really, really difficult to get a good scrape. Aaaaagh! 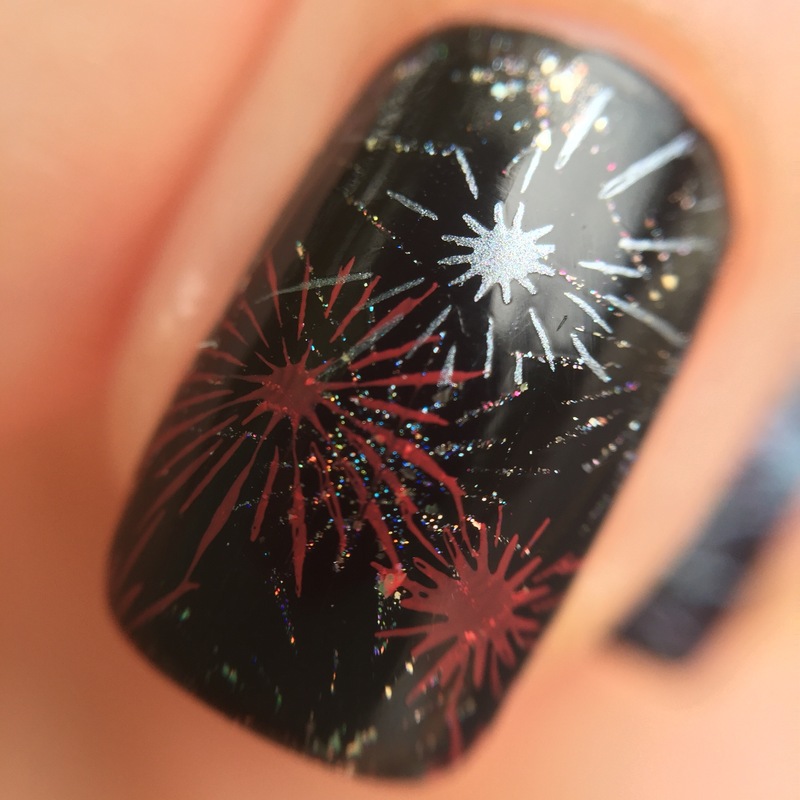 I used the Colors by Llarowe and ILNP polishes as the first layer of stamping because they were holos with big holographic particles that would catch the light and look like those fading sparkly fireworks (my favorite kind). Although the effect is subtle, I almost like them more than the brighter firework colors in front! Check out these macros. Honestly, this mani looks better close up than it does from a distance. What do you think? Did you get to see any fireworks this weekend? 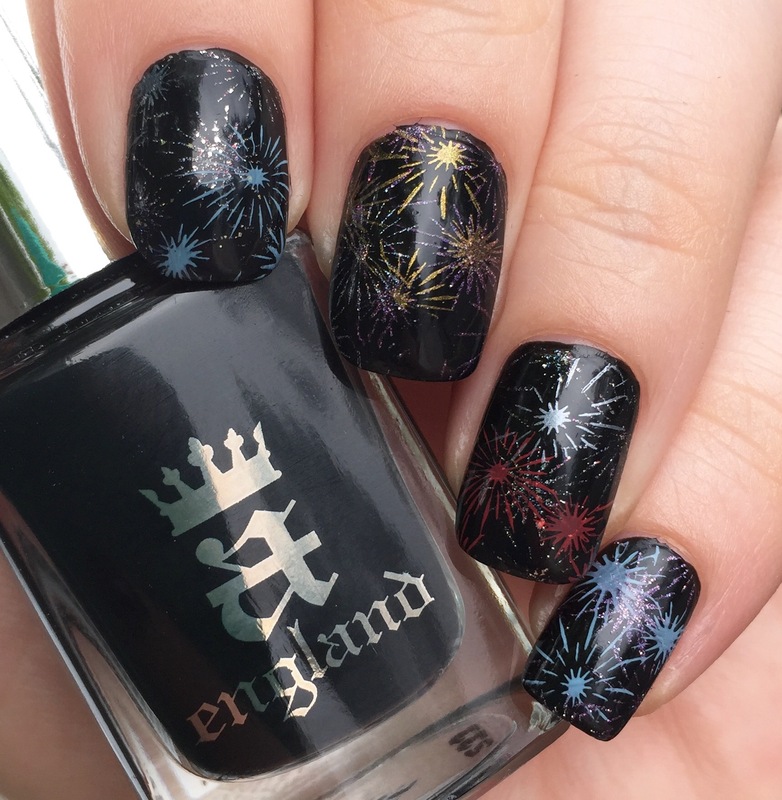 What fireworks are your favorite? My city’s show this year had a new kind that mostly just flashed white light and banged loudly without spreading out at all- I was not a fan. But I love the ones that look like enormous, sparkly willow trees! Oh wow this is beautiful!!! These are absolutely gorgeous! I don’t blame you for the zillion photos if I had done something so cute lol. This looks so cool! Love how you layered the stamping. Thanks! Haha it took more practice than I anticipated. My right hand looked ridiculous. The layered stamping is killer. I love this mani! I haven’t seen fireworks for a couple years now- with the longer days of summer and my toddler’s bedtime, it isn’t in the cards for me for a long time. Apparently you could see some from down the street of my house the other night, but I was already dressed down for the night and wasn’t about to go through the effort of getting dressed. I’m sure my neighbors already think I’m weird for taking photos of my nails so why add to that, lol! This year is actually my first in a long time seeing the Fourth of July fireworks- I’m usually out of the country doing fieldwork so I was really excited to get all patriotic and do the bbq/fireworks thing. This couldn’t have turned out more perfectly! Beautiful! I love the willow trees one too! We didn’t watch this year. My kid is down at my mom’s for 3 weeks, so hubs and I stayed in to make sure the pup wasn’t too traumatized since we are near several locations that set them off. This is just stunning! Holy crap! This looks fantastic! I’m going to have to pick up that image plate for next year. It could probably work for NYE too! 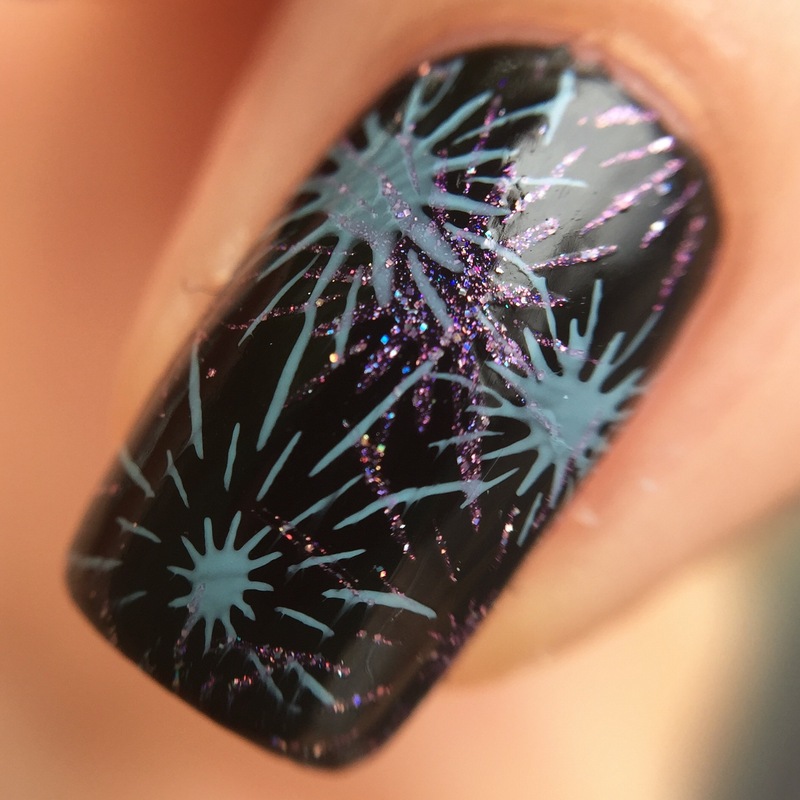 The holo polishes put these over the top. Very cool!